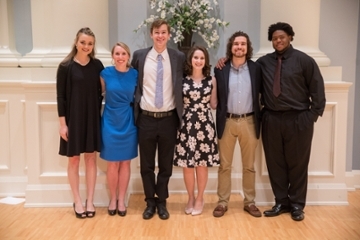 The Division of Music in Samford University’s School of the Arts celebrated the talents of students, and presented multiple awards and scholarships provided by generous patrons at the annual honors recital April 5 in Brock Recital Hall. The longstanding tradition included performances by six students, and awards presented by faculty members Kathryn Fouse, Joseph Hopkins, Sherrie Lawhon, Joel Davis, and Eric Mathis. Student performers included Jalen Morgan, David Roby, Mary Kathryn Evans, Brooke Proctor, Samuel Robertson and Anna Taylor. Awards include scholarships provided by numerous donors in attendance. Mary Kathryn Evans was honored with the Eva Clapp White Memorial Voice Scholarship Award established by Paul Gaston White and the Northrup Scholar Award. Samford Arts patrons Jeff and Lori Northup established three awards and Anna Taylor received the Northrup Instrumental Performance Award. Olivia Jones received the Northrup Keyboard Performance Award. These students were chosen because they represent the highest standard of musical performance. Gloria Roy, a junior from Kolkata, India received the Shepherd-Walker Award, which is given to the music student who has graciously used his or her talent and education to enrich the lives of others.